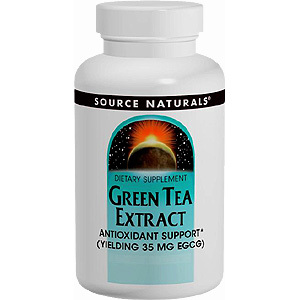 Source Naturals GREEN COFFEE EXTRACT (GCA(TM)) is a powerful antioxidant that helps protect against oxidative stress caused by free radicals - a major cause of accelerated aging. Derived from raw, unroasted coffee beans and naturally low in caffeine, green coffee extract has been shown in research to support normal cellular regeneration and growth. Green coffee extract is high in chlorogenic and caffeic acid, two primary compounds responsible for the activity of green coffee. 1 tablet 1 to 4 times daily, or as recommended by your health care professional. Each tablet provides the amount of polyphenols and chlorogenic acid found in an average cup of coffee. Best if not taken in combination with milk or milk containing products - milk proteins may inhibit absorption of polyphenols, some of the active components in coffee and tea. If stomach discomfort occurs, take with food. 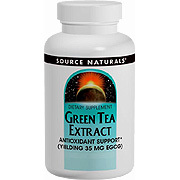 Green Tea Extract 100 mg - 60 tabs is shipped in a discrete, unmarked package. Orders are processed immediately and usually take about 3 to 5 working days to be received. We do ask that you try it for 2 to 3 weeks to feel the full effects. Any information received is used only for order processing and shipping purposes. Your information, such as e-mail address, will never be disclosed to a third party.